Nampo-dong Busan is one of my favorite places here. It is full of shopping, both popular stores, market stores, vendors and tons of street food. The hohtduk is my favorite. It is similar to a fried donut filled with healthy seeds (kind of granolaish). In the summer, you can also pick up some really tart and fresh lemonade (with bubbles) and cherries. You can have dukbogie and gimbap, blood sausage, dumplings and fish cakes! But do come prepared for crowds. It is a little overwhelming to shop down the narrow side roads while tons of people are pushing past you. But its easy to get caught up in the experience. If you are making a day trip out of Nampo-dong, it is easy to also visit Jalgalchi Fish Market and Busan Tower at the same time. 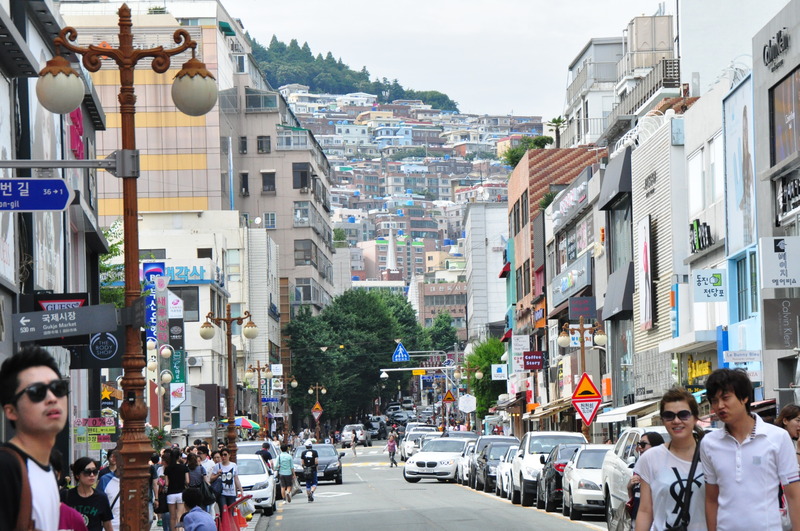 Walking down the main street in Nampo away from the market area… you will see a huge escalator on the left. This will take you up to Busan Tower. They are all very near to each other. If it gets too hot out, you can always head to the large Lotte Shopping Department store. Inside, they have the worlds largest water fountain music display/show in Asia.